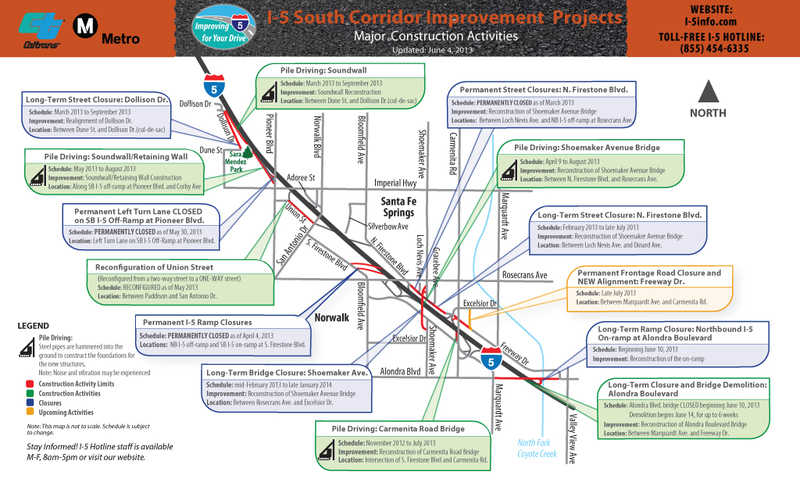 The Santa Ana Freeway (I-5) Carmenita Road Interchange Project, in the cities of Santa Fe Springs and Norwalk will replace and reconstruct the existing two-lane overcrossing with a 10-lane (five lanes in each direction) structure. The project wil reconfigure the on- and off-ramps, and will realign the following frontage roads: Firestone Boulevard, Freeway Drive, Carmenita Road, Arctic Circle, Molette Street and Excelsior Drive. 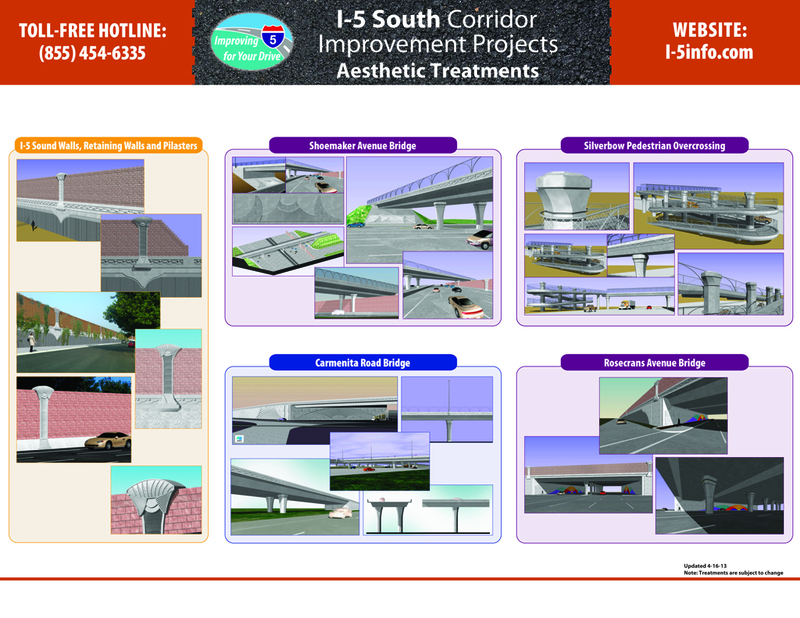 The project will also widen I-5 from Alondra Boulevard to Shoemaker Avenue by adding one High Occupancy Vehicle (HOV) or car pool lane, and one general purpose lane in each direction, as well as widen the shoulder and construct a median barrier. Thank you for your patience. For more information, please call toll-free (855) 454-6335. •	New Carmenita Rd bridge opened all lanes to traffic June 18. 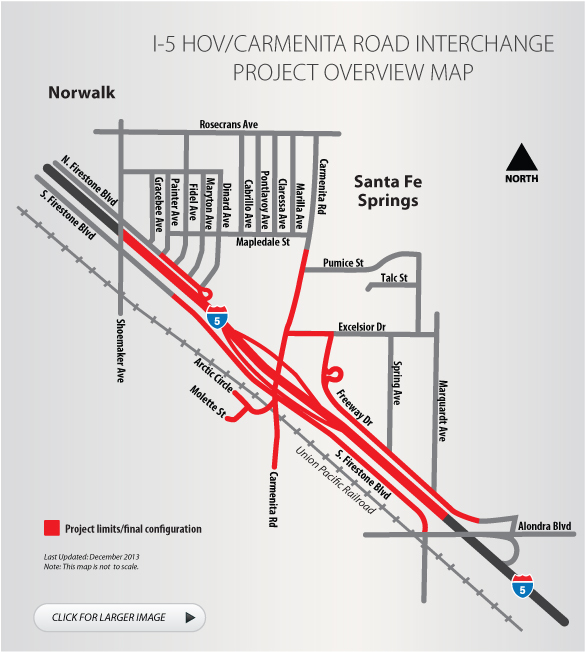 •	On Saturday morning, June 18 the new Carmenita Rd on- and off-ramp to northbound I-5 officially opened to traffic! Old Carmenita Road Bridge, taken from atop the new bridge, set to open Friday morning, July 3.